Since January of 2018 our guild has donated 129 baby quilts to Newborns in Need; they distribute the baby quilts to other charities and to the local hospitals, wherever the need exists. Our twice yearly Sew-Ins attract about 20 – 25 sewers. Our guild also has baby quilt kits available at our monthly meetings for members to take home and complete. Contact Bobbie Thorne or Sandy Sutton for a kit. We hope to reach or surpass our goal of 250 baby quilts donated by the end of 2018. We have lots of fun and put lots of love in stitching the baby quilts….. The May monthly meeting had numerous events….. There was voting on the Golden Thimble Award for 2018. We will know who by next month who receives this coveted award. There was lots of information about our upcoming quilt show. 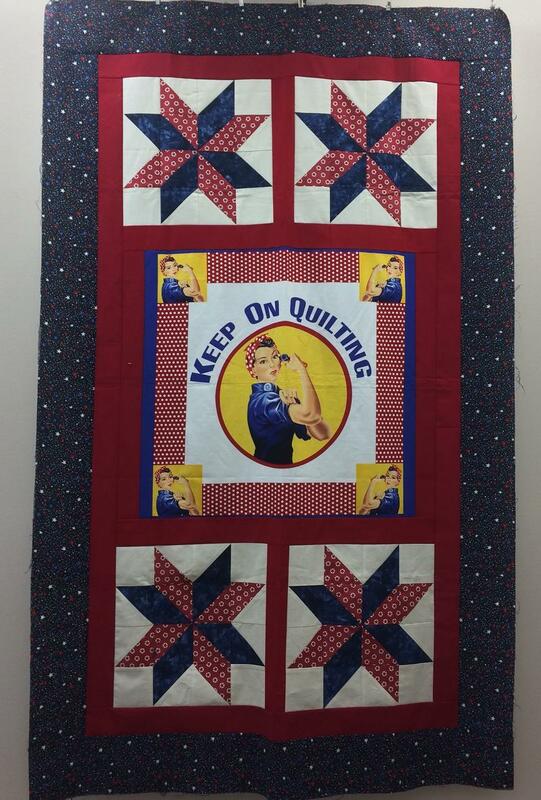 Registration is open for your quilt entries, quilts for bed turning and for the silent auction. Judy Glover, outgoing President, was given a quilt in appreciation for her outstanding efforts while in office. February’s monthly meeting was very enjoyable because of Merrily Parker, owner of Merrily We Quilt Along in Springfield. She entertained us with stories. The picture shows one of her first quilts that was made out of 32 yards of fabric (she knew little about quilting when she bought the fabrics). She showed us quilts from her family and others that she made. Many of her first quilts were quilted using a domestic machine. 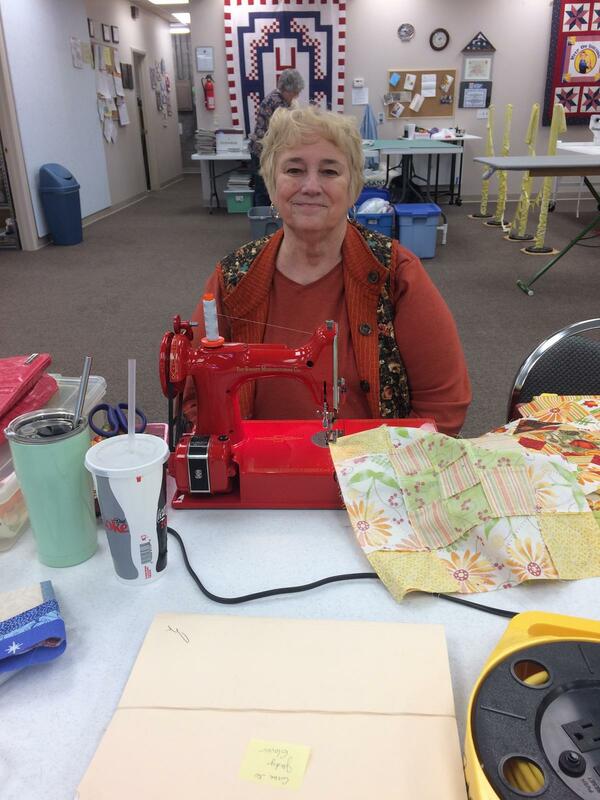 Everyone got a chuckle when she told us that “now she quilts using a checkbook.” Everyone in attendance got a $5 gift certificate to her shop. Now, aren’t you sorry you missed the day? The lovely ladies surrounding the Baby Quilt co-chairmen, Bobbie Thorne and Sandy Sutton (front center), sewed some cute baby quilts last Friday. It was cold outside but warm inside and a great day for sewing! Look at some of the completed tops……. Per our existing Bylaws, a committee to Review Bylaws was created in 2017 to perform a review of the Guild Bylaws. The committee consists of Marilyn Bilyeu, Rhonda Colton, D.J. Maas, Joyce Sanders, Janice Woodring, and Nancy Yeomans. The recommendations were presented to the Board at the January, 2018 meeting. Due to recent changes in requirements and the size of the Guild, it was determined that a major overhaul of the Bylaws is needed. The existence and use of the Bylaws is for the protection of the Guild. It describes how the Guild functions and is a portion of the requirements to be a not for profit organization. Currently we have two Documents – the Bylaws and the Policies. With the approval of the revised bylaws, the Policies document is renamed as the Standing Rules. · Voting on the revised Bylaws will occur in the April Meeting. Due to the size of the new documents, they are not included in the newsletter. Those members currently receiving paper copies of the Newsletter will receive paper copies of the Bylaws and Standing Rules in the mail. In order to adequately protect our Guild, the two new documents are 48 pages. As a result, the Committee strongly urges you to NOT PRINT A COPY. Please help save trees by reading the documents on your computer devices. Many, many hours were spent by the Committee to complete their assignment. We even had pro bono attorney assistance in research and legal review. The proposed Bylaws and Standing Rules exceed current requirements and should favorably position the Guild for years to come. If you have any questions, please email Nancy Yeomans at PinkSmoot@gmail.com . Posters to Wikipedia, suggest Quilting began in Europe, sometime in the 12th Century, and came across the Atlantic to America, with the Pilgrims. In the years since, American quilts and quilt making has seen a variety of forms, including Colonial Quilts, Medallion Quilts from the mid-19th Century, Whole Cloth, and Crazy Quilts. According to the Wall Street Journal, there are over 21 million quilters in the United States. 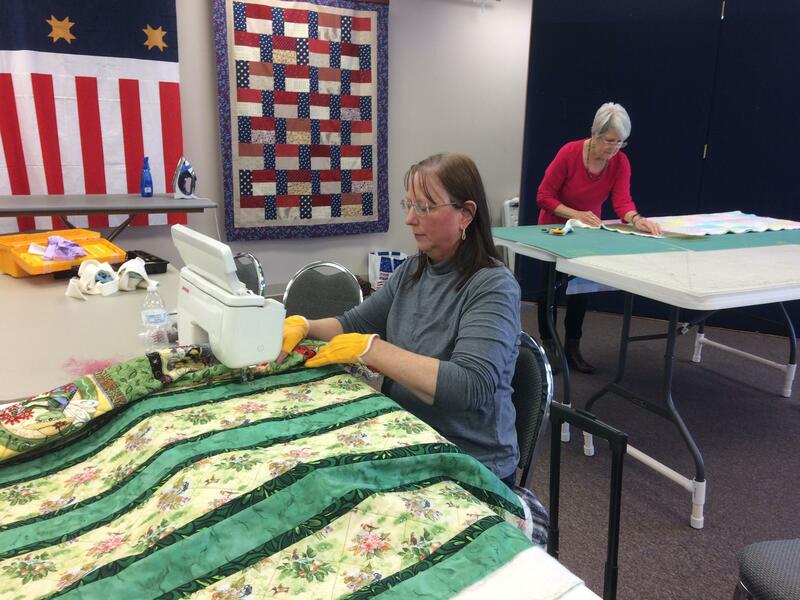 Around 300 quilters are members of the Ozark Piecemakers Quilt Guild. I tell my husband Gordon, (quilting) it’s my tranquilizer. 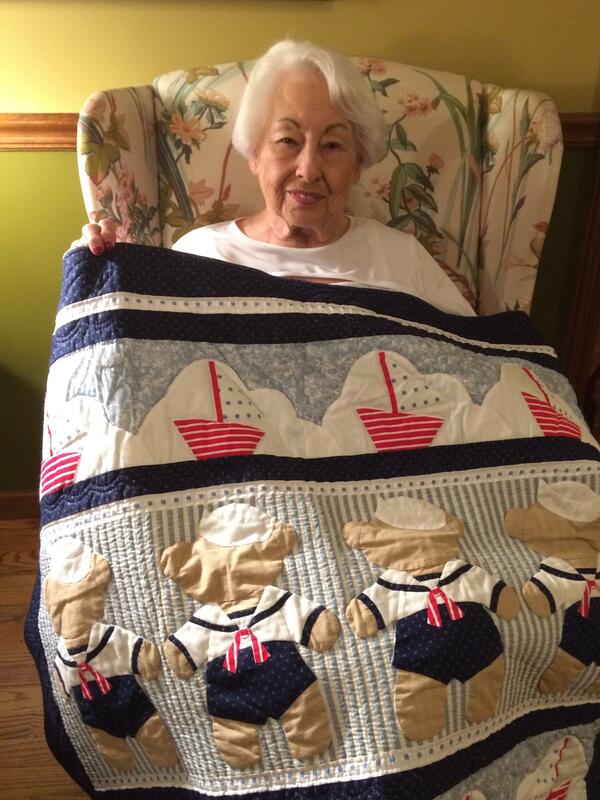 I happen to like almost any quilt, I’m that sold on them” says Mona McCann. 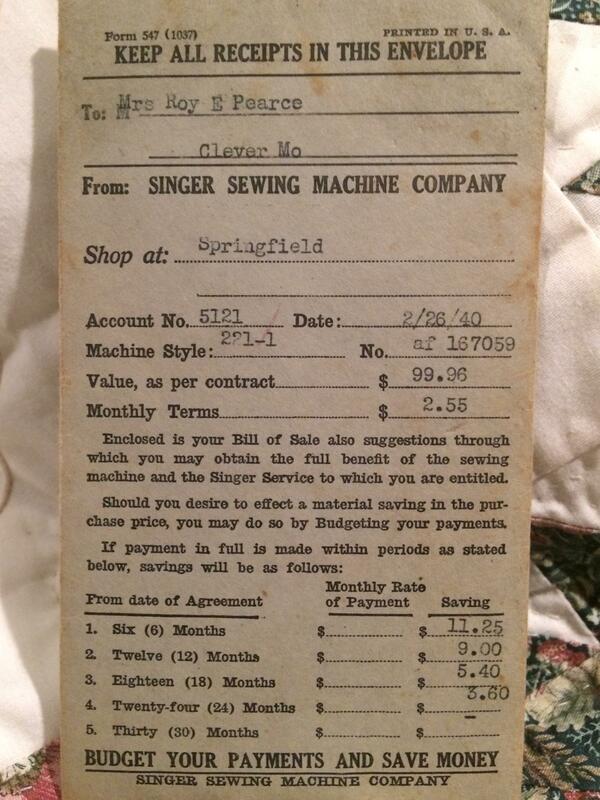 Mona McCann’s mother’s paperwork from her purchase of the Singer, show the transaction took place at the Springfield Missouri Singer Shop, February 26, 1940.